Now, the 12-year-old distillery is hoping to make a splash outside of the state. Later this year, seven other states will get a taste of Treaty Oak’s gins in particular, which are relaunching with a new look just in time for the beginning of a nationwide rollout. Treaty Oak has partnered with booze brand incubator Mahalo Spirits Group to bring its bottles to California, Florida, Georgia, Illinois, Michigan, Tennessee and Virginia. In the next couple of years, the remaining U.S. states will also start to carry Treaty Oak products — including a trio of whiskeys, such as the well-known Red Handed Bourbon, that are set to be redesigned and relaunched, too. For Treaty Oak founder Daniel Barnes, who opened a sprawling distillery ranch in Dripping Springs three years ago, the expansion and redesign had been a long time coming, as well as a way to reevaluate what was important to the company. In that regard, the redesign process became “a borderline spiritual search that reflects what we want the distillery to be moving forward,” Barnes said. “We’re moving toward the things we like to drink, hence the removal of the vodka from our portfolio and the slowdown of our beer program,” which is now available only at the Dripping Springs property. Yes, you read that right. As Treaty Oak doubles down on gin and whiskey, two other spirits are getting cut from the portfolio: Starlite Vodka, which is no longer featured on the Treaty Oak website, and Treaty Oak Rum, which is getting phased out despite Barnes’ love of the product. The rum won’t be completely extinct at the Dripping Springs ranch, however: Barnes said Treaty Oak will be releasing small-batch aged rums, some as old as nine years old, for visitors to the scenic Hill Country property. Plus, the available gin and whiskey are better than ever. 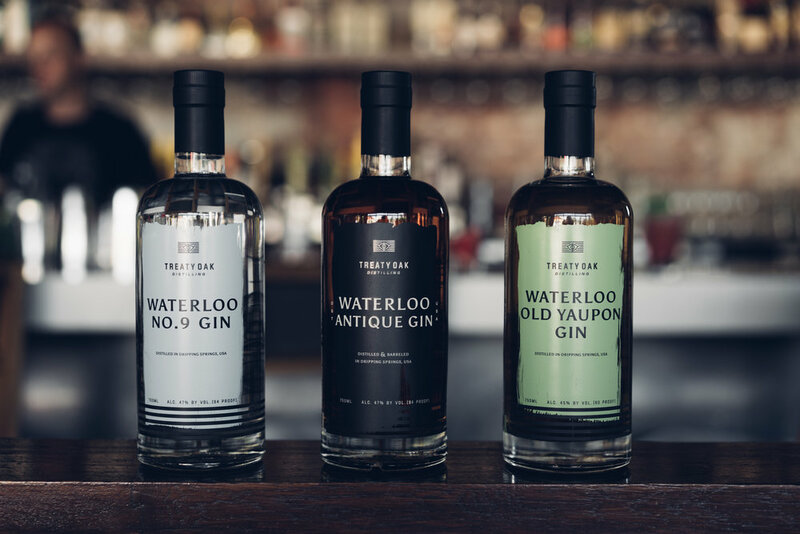 The three gins with redesigned bottles are Waterloo No. 9 — a name that nods to the original recipe of Treaty Oak’s citrus-forward spirit, the very first gin to be released in Texas — as well as Waterloo Antique Gin and Waterloo Old Yaupon Gin, the newest of the trio. Waterloo Old Yaupon Gin, as the name suggests, features as one of its botanicals the yaupon holly, a plant native to Texas and particularly prolific in Bastrop. Along with the necessary juniper, the ingredients also include kaffir, lime, anise and local wildflower honey. In the old tom style of gin, it’s a little sweeter and less focused on botanicals, unlike most gins on the market today. Each of the Waterloo gin bottles, designed by Barnes’ wife Rachael and powerhouse firm Crispin Porter + Bogusky, features a single color, one for each expression, dashed across the front label as though it was painted on. The bottles look remarkably different than their previous counterparts, and the whiskey ones will, too. “It was time for a refresh,” Barnes said. In addition to running Treaty Oak, he has also been in charge of helping to launch Mighty Swell, a line of ready-to-drink spritzers, and Waterloo Sparkling Water in the past few years. With a renewed focus on his beloved distillery, Barnes and the rest of the Treaty Oak team are now focusing on new small-batch projects. Foremost among them is the Local Gin Project, a collaborative series that will create a regional gin in various parts of the country using ingredients common to the area. Treaty Oak has teamed up with a prominent Georgia chef for a deep south gin, and a Texas gin and West Coast gin are also in the works. Originally published via Austin360 by Arianna Auber.